The Audi A3 is accelerating to catch up with the Vorsprung durch Technik brand’s latest technological developments – a new, even more sharply styled A3 featuring new engines and accommodating the latest driver assistance and infotainment advances, including the standard-fit Audi smartphone interface and the optional fully digital Audi virtual cockpit, becomes available to order in May. The first three-door, five-door Sportback, Saloon and Cabriolet versions, headed by their respective S3 flagships, will arrive with UK customers from late summer. The plug-in hybrid A3 Sportback e-tron with its 176mpg capability and 37g/km CO2 output will also make its debut in updated form later this year. The highlight in the interior of the new Audi A3 is the Audi virtual cockpit, which can now be specified as an alternative to the standard analogue unit. This innovative operating concept, which is available for the first time in the compact class, displays the most important driving-relevant information in high resolution on a 12.3-inch diagonal TFT screen. The driver can switch between two views by pressing the “View” button on the multifunction steering wheel. In classic mode, the instruments appear as large as the usual analogue displays. In infotainment mode, however, a central window predominates, which provides more space to the navigation map or shows lists for the telephone, radio and audio. The rev counter and speedometer appear as small round clocks. The menu structure in the MMI system has also been redesigned. Operation with its flat hierarchies is based on smartphones. The centerpiece of the MMI terminal is the round rotary/push-button control, whose ring is illuminated in white in the top version. On its surface is the optional touch-sensitive touchpad for entering characters and for multi-finger gestures, allowing the driver to zoom within the map. Above and beside the rotary/push-button control are toggle switches and buttons with which the driver can navigate through the newly designed menu structure. The enhanced voice control for navigation, radio, media and phone now also understands many phrases from everyday language. 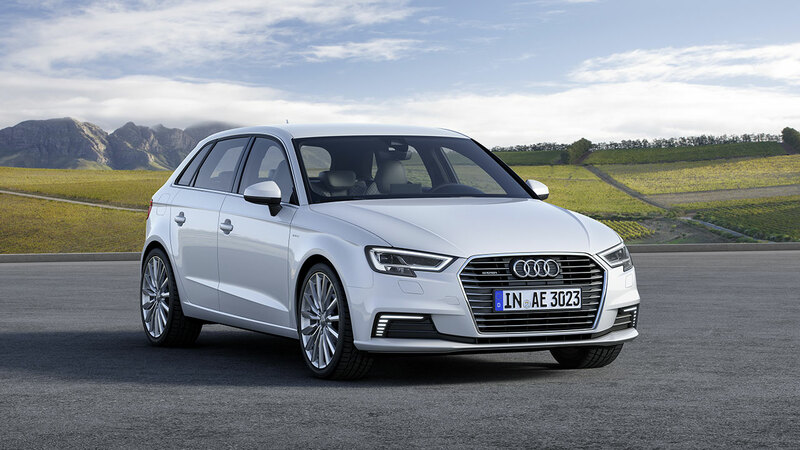 In infotainment, the new Audi A3 again sets new standards. The MMI radio plus with the electrically extended 7-inch diagonal monitor is standard equipment. MMI navigation (standard on SE Technik and above) and MMI navigation plus with MMI touch in conjunction with the Audi connect module bring many online functions into the car at high speed via the super-fast LTE standard. They include, for example, navigation with Google Earth and Google Street View traffic information in real time as well as practical information on parking, destinations, news or the weather. When the optional Technology package which now includes a three year subscription to Audi Connect is specified, the flat rate data plan that enables owners to access Audi connect services is now included ‘out of the box’ thanks to the Audi connect SIM card pre-installed in the car. Customers receive this embedded SIM (e‑SIM) in combination with Audi connect in Europe. It permits roaming in most European countries. The free Audi MMI connect app enables other services, such as online media streaming and transfer of a calendar from a smartphone to the MMI. The A3 e-tron also features services for programming the charging and the departure time and for the air conditioning. Mobile phones with iOS and Android operating systems can now be connected with the car via the standard Audi smartphone interface, which made its debut in the latest Q7 and A4 models. The optional Audi phone box in the centre armrest uses near-field coupling to link smartphones wirelessly to the vehicle’s antenna and enables inductive charging. For the first time in the Audi A3 range, two mobile phones can now be simultaneously connected via the Bluetooth hands-free profile when Audi Phone Box is specified, enabling the driver to connect his/her work and personal phone without having to switch between connections. 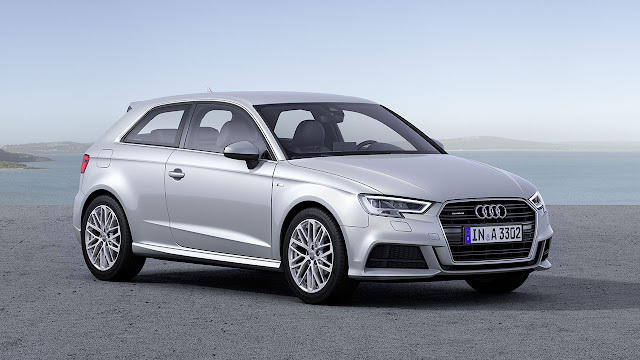 With numerous driver assistance systems, the new Audi A3 raises the bar in the premium compact segment yet again. New to this model and to the segment is the traffic jam assist system, which works together with Audi adaptive cruise control (ACC) to keep the A3 and S3 at a safe distance from the vehicle in front, and in combination with the S tronic transmission, automatically sets it in motion again after a short stop. In congested traffic, the system can even work in combination with Audi active lane assist to briefly take over the steering on well-surfaced roads at speeds of up to 40mph. Another new feature available for S tronic versions of the A3 family in conjunction with adaptive cruise control and Audi active lane assist is the optional Emergency Assist, which initiates braking down to a safe stop if, despite warnings, no steering activity by the driver is detected. The new rear cross-traffic assist can also be specified in combination with Audi side assist or the Audi parking system plus to warn the driver about cross traffic when slowly backing out of a perpendicular parking space, for example. The further developed Audi active lane assist and Audi pre sense front, including predictive pedestrian protection, also make town and country driving even safer. Although hardly any change has been made to the dimensions – 4.24 metres in length with a wheelbase of 2.60 metres – the new Audi A3 looks more purposeful than ever. Its Singleframe grille features sharper lines and is broader, and its headlights are flatter, with distinctive outer contours. 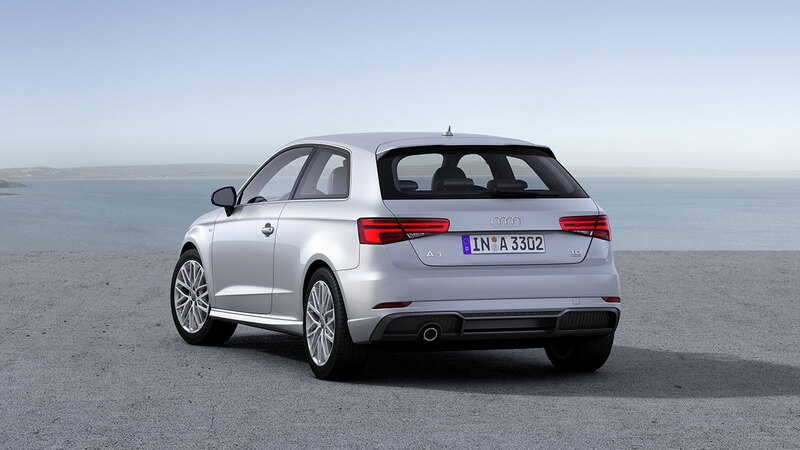 The rear accentuates the width of the new A3 – with the horizontal illuminated graphics of the rear lights and the separation edge above the redesigned diffuser. The colour palette has also been expanded. Twelve paint colours are available to choose from depending on specification, including the five new colours Ara blue, Cosmic blue, Nano grey, Tango red and Vegas yellow. The engine line-up for the Audi A3 comprises six engines (three petrol and three diesel units). Their power output ranges from 110PS to 190PS. All fulfil the EU6 standard. The 1.0 TFSI engine is a new entry-level choice for the A3 range, and notable for creating its first ever three-cylinder variant. The compact engine delivers 115PS and 200 Nm (147.5 lb-ft) of torque at 2,000 to 3,500rpm, and its inherent efficiency is achieved without sacrificing anything in terms of driving pleasure. The 1.4 TFSI COD features cylinder-on-demand efficiency technology, turning off two cylinders when the corresponding output is not required. The engine with 1,395 ccm displacement offers 150PS and 250 Nm (184.4 lb-ft) of torque. A technical highlight is the completely new 2.0 TFSI with its innovative combustion process. From a displacement of 1,984 ccm it generates 190PS, delivering 320 Nm (236.0 lb-ft) of torque at 1,500 to 4,200rpm. The consistently popular 2.0-litre four-cylinder TDI engine with 1,968 ccm displacement will be available in two states of tune in the new A3 – 150PS and 340 Nm (250.8 lb-ft) at 1,750 to 3,000rpm – and slightly later with 184PS and 380 Nm (280.3 lb-ft) at 1,750 to 3,000rpm. The entry-level diesel engine is the 1.6 TDI with 110PS. It is available in combination with the six-speed manual transmission or the S tronic seven-speed dual clutch transmission. 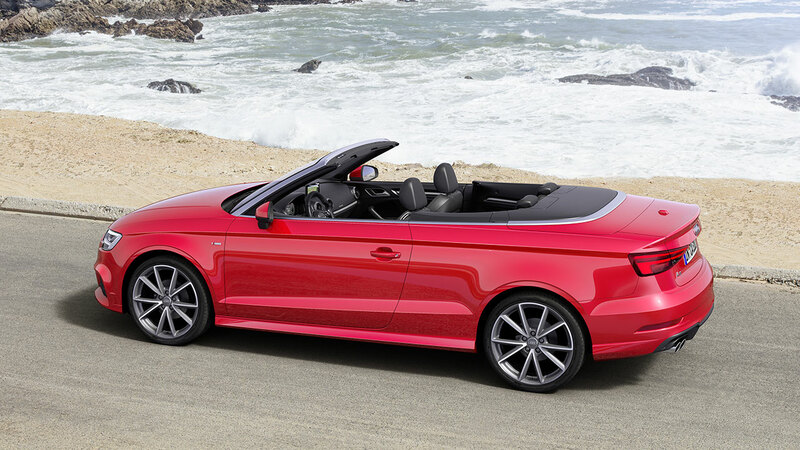 The 2.0 TFSI engines are joined by a fully newly developed seven-speed S tronic twin-clutch transmission with wet clutch. It replaces the previous six-speed dual clutch transmission with dry clutch. 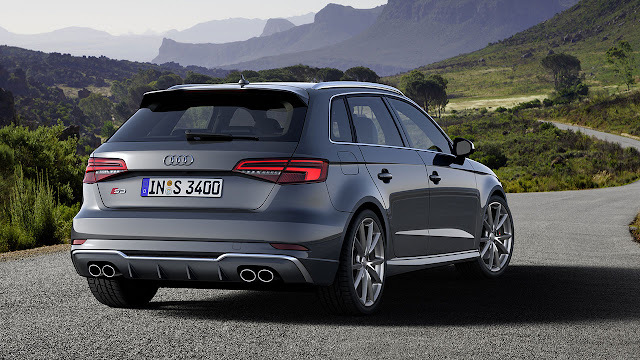 The new Audi A3 transmits the engine power to the front wheels by default. 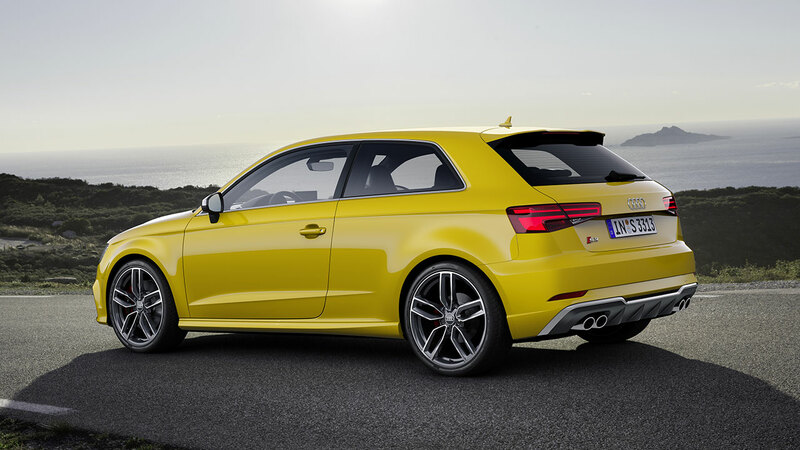 For the petrol-engine versions, quattro all-wheel drive is available for the 2.0 TFSI with 190PS. 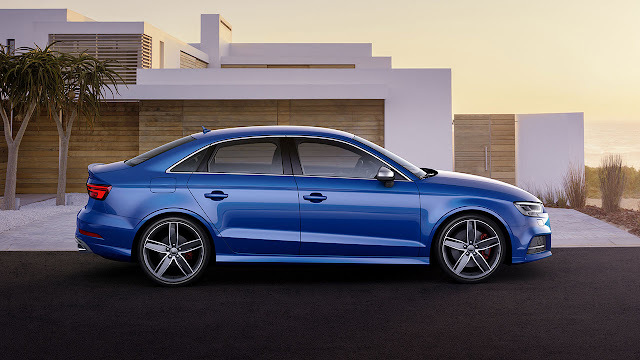 The suspension of the new Audi A3 impresses with its impressive combination of suppleness and balance. With the optional sport suspension (standard on S line models), the body sits 15 millimetres lower, and 25 millimetres lower with the optional S line sport suspension available at no extra cost. The electromechanical power steering is sensitive and efficient in operation. It can be upgraded in many models to the electrically powered progressive steering system that is standard in the S3 series. The new Audi A3 rides on 16-inch alloy wheels in SE form, and on 17-inch and 18-inch wheels when equipped to Sport or S line specification respectively. The wide range of optional wheels ranging in size from 17-inch to 19-inch includes new designs. The headlights of the Audi A3 provide a distinctive new look with their jagged bottom edges. Xenon plus units with LED daytime running lights are standard, with the exception of S line and S3 models which now automatically come equipped with LED headlights and LED rear lights incorporating sweeping dynamic rear indicators. For the first time, matrix LED headlights are offered as an option. Light and rain sensors are fitted as standard in all specifications. Consistent lightweight design has brought the kerb weight of the Audi A3 with 1.0 TFSI engine down to just 1,150 kg – the lightest in its class. The body of the new Audi A3 is crashproof and rigid to a high extent. A noise-insulating windscreen is standard equipment. 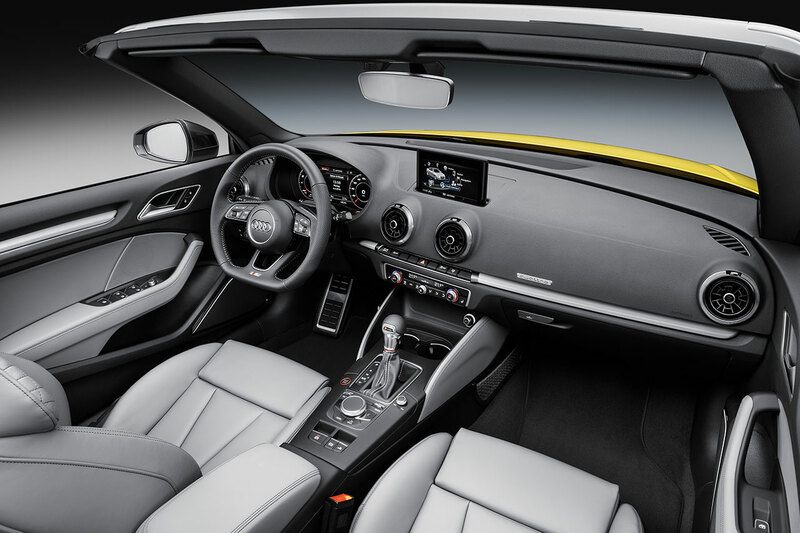 The interior affords the top quality typical of Audi. Cruise control is now standard equipment on SE models, and the newly designed three-spoke steering wheel also fitted as standard to the entire range is available with heating as an optional extra. For more comfort on long journeys, Audi offers a driver seat with massage function in the new A3. Another highlight for S line models is the interior lighting package, now fitted as standard. The plug-in hybrid e-tron version of the A3 Sportback combines a 1.4 TFSI engine with 150PS and 250 Nm (184.4 lb-ft) of torque with an electric motor that produces 75 kW and 330 Nm (243.4 lb-ft). The system output of 204PS permits excellent response. Full charging of the lithium-ion battery (8.8 kWh) from a 380-volt three phase-current supply takes a little over two hours. 10PS more power and, in conjunction with the S tronic, 20 Nm (14.8 lb-ft) higher torque – the already potent S3 has developed its muscle as part of the wholesale overhaul of the A3 range. In addition, Audi engineers have integrated S3-specific control for the Electronic Stabilization Control (ESC) and the multi-plate clutch for improved driving dynamics, driving pleasure and safety. The 2.0 TFSI now generates 310PS and with S tronic delivers 400 Nm (295.0 lb-ft) over the large range of 2,000 to 5,400 revolutions per minute. The S3 Sportback, S3 Saloon and S3 Cabriolet also profit from the extensive new features.